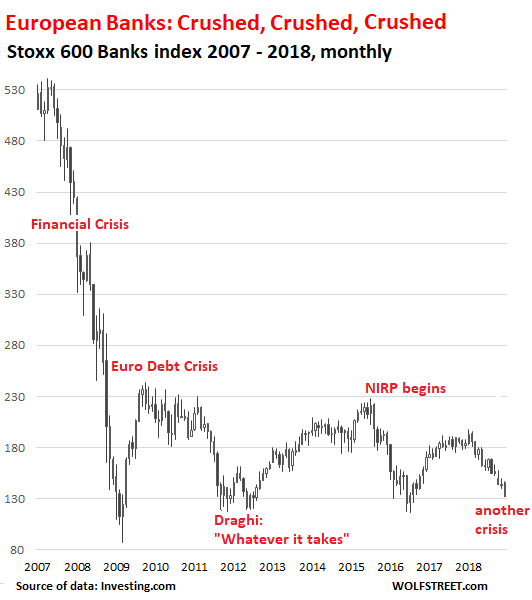 The European Commission — the executive branch of the EU — after nearly three years of investigating this, announced today that is suspects four unnamed banks of colluding to manipulate the vast market for US-dollar-denominated government-backed bonds between 2009 and 2015. “The European Commission has informed four banks of its preliminary view that they have breached EU antitrust rules by colluding, in periods from 2009 to 2015, to distort competition in secondary market trading in the EEA of supra-sovereign, sovereign and agency (SSA) bonds denominated in US Dollars,” the statement said. 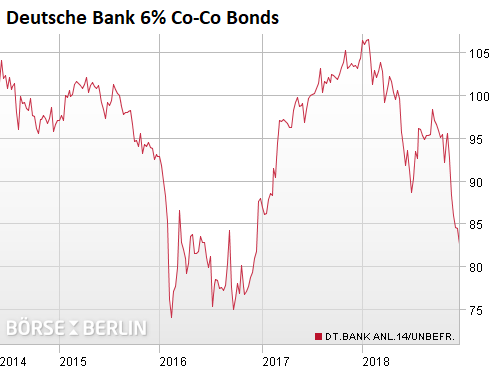 Deutsche Bank’s contingent convertible bonds — designed to be bailed in when the bank’s regulatory capital falls below a certain level — are a measure of what the market thinks about the chances of such an event. They’re unsecured perpetual bonds that can be canceled when regulators think the bank needs more capital to avoid toppling. In this event, stockholders and Co-Co bond holders would likely get wiped out by taking the first loss. Other creditors might get a haircut. And taxpayers would be shanghaied into paying for further capital if needed. 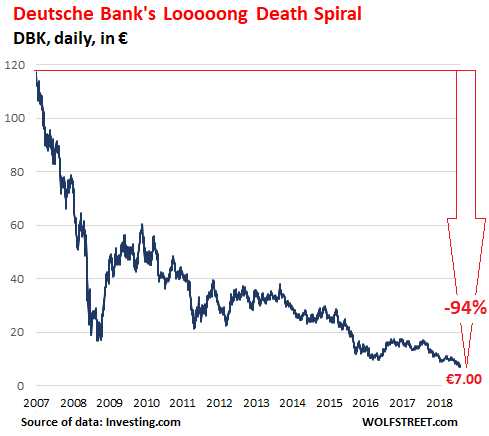 Deutsche Bank’s stock has been in a death-spiral since 2007, following an intense price bubble that ensued as the once conservatively run bank for Germany Inc. and German retail customers transitioned to becoming a global player in just about everything that has caused banks to collapse. Bottom fishers were regularly taken out the back and shot. 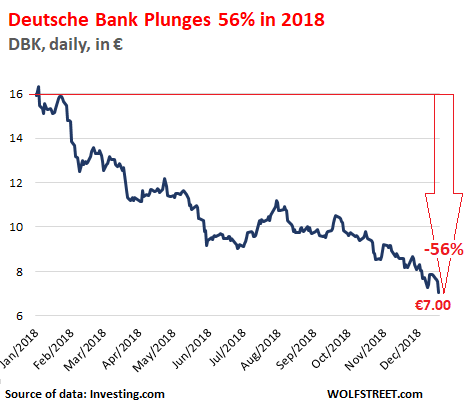 But it’s not just Deutsche Bank. The outfit is an example of a broader development in Europe where the years following the financial crisis, the years of zero-interest-rate policy and negative-interest-rate policy — ZIRP and NIRP — weren’t used to rebuild bank capital and clean up balance sheets and get rid of non-performing loans, but were instead used to prop up the sovereign debt of euro countries whose governments can’t handle a hard currency they can’t devalue, such as Greece, Italy, Spain, and Portugal. Propping up government debts worked. But the banks, the financial infrastructure of an economy, are a massive unfixed risk. 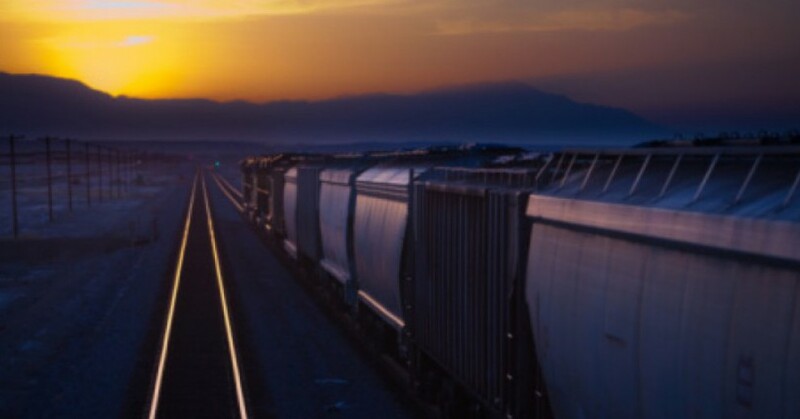 Under the new rules, bailouts would now wipe out, or at least crush, shareholders and some junior creditors, such as Co-Co bondholders, before taxpayers will be shanghaied into cleaning up the rest. 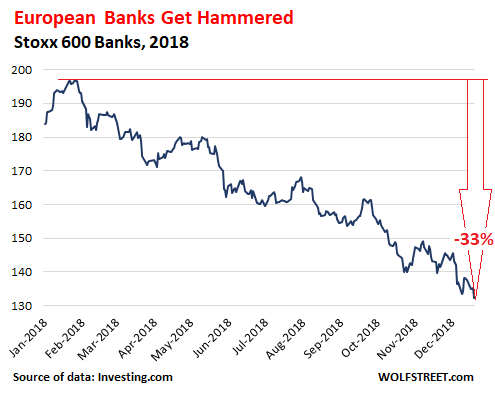 Clearly, the market sees these European banks as a mess that will remain a mess and has a superb chance of getting a lot messier. This entry was posted in banking, Business, Currencies, Debt, Economy, Financial markets, Governments and tagged Deutsche Bank, European banks. Bookmark the permalink.